I got a little obsessed with making sunsuits. They are just so adorable. It's still hot here in Queensland so Alyssa will get a few wears out of them. What I have discovered is by simply playing around with fabrics and modifying the designs slightly I get a completely different result. It is a lot of fun. This is the Little Betty Sunsuit with ruffles on the straps instead of the bottom. I made a mistake and the seams of the straps ended up facing the front so I decided to put an extra layer of fabric on them. It worked really well as it made the straps stronger. I found that with the original pattern (see next image & my previous post) the front of the straps didn't sit flat and twisted and folded with Alyssa's movements. With the sunsuit below I thought it would be a good idea to make it a little higher in the back and a little wider at the crotch. It ended up being too high and too wide. I have a growing appreciation for pattern makers. It is not as simple as it looks! 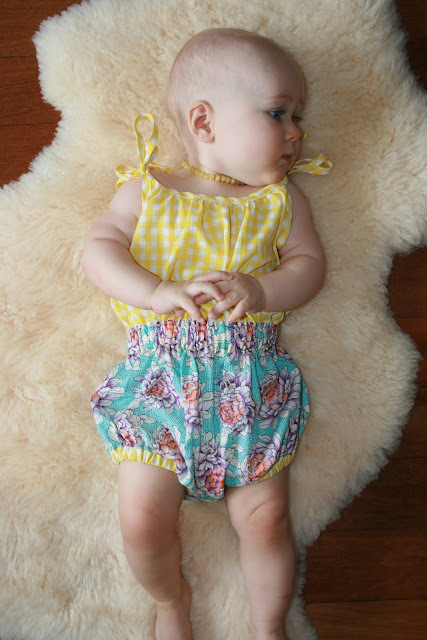 This is the same pattern I used for my Vintage Sunsuit and the Pretty in Blue Sunsuit. I really like the effect from using two contrasting fabrics. It makes it much more interesting. I was unsure about the fabric choice right up until the final seam was sewn, but I think I like it. Oh my, I'm loving all these sunsuits, esp the first one! If I ever have a little girl, I'm definitely making her some of these! Oh and P.S. Thanks for following my blog, and I'm excited to see what you make next!